Training Mask Review: Can It Improve Body O2? Home » Training Mask Review: Can It Improve Your Body O2? Training Mask Review: Can It Improve Your Body O2? Click the Tabs above to see more content about this sport and fitness device: Elevation Mask that simulates high altitude training. Other breathing devices for fitness and sports, such as PowerBreathe, Expand-a-Lung, or PowerLung, could not be used continuously during physical exercise. However, the Training Mask can be applied while running, cycling, weight lifting and doing many other activities, for 20-30 min or longer. This Elevation Mask reduces flow of air, minute ventilation, and oxygen supply during exercise. It also increases CO2 content in the alveoli of the lungs providing the body with mild hypoxic (less O2) hypercapnic (more carbon dioxide) training. Personally for me, it is rather a running mask since I tried it, for over 2 years, for running, up to 30-60 min and even longer (up to 90+ min) in one exercise session. Among famous athletes who found the Elevation Training Mask 2.0 beneficial are Sean Sherk and Ironman World Champion Pete Jacobs. Originally, for a number of years, the Training Mask was promoted due to its use by Sean Sherk. Sean Keith Sherk is a now retired American mixed martial artist and former UFC World Lightweight Champion. Mr. Sherk is the first of only two who fought for both the UFC Lightweight Championship and UFC Welterweight Championship. More about him from Wikipedia here. Ironman 2013 World Champion Pete Jacobs was so excited about the physiological benefits, which he experienced with the Elevation Training Mask 2.0, that he met with its developers and now has a financial interest in the company. I tested this Mask on my breathing students and found its profound and consistent effect on breathing and body O2 after physical exercise. This is the main reason for this positive review. The mask makes physical exercise nearly 2 times more effective. There is no desire to overbreathe even after very long physical exercise with the elevation mask. This is a great effect since, for many years, I tested different methods and techniques to reduce ventilation during exercise with breath holds, reduced breathing and other methods. These methods do work and have some later effects, but the Mask 2.0 makes life much easier. Put the mask on, and relax while running or doing something else. If you want to buy this great sport and fitness device, there are 2 main options to buy the Training Mask. (Update: September 2014.) If you buy the mask from producers, the current price for US customers is 100 USD (with delivery included) via this link: ). Here is the link: Training Mask. Success in your health and sport performance. I have a beard. 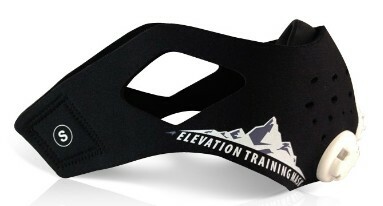 Can I still use the Elevation Training Mask 2.0 while running and during weight lifting? Yes, many people did so and got benefits from the device. If you apply some Vaseline or other skin creams, the Mask will have nearly normal air tightness or sealness. Can this High Altitude Mask be used during sleep? I have sleep apnea and hope it will help. The Mask was not tested during sleep and its effects on sleep requires additional research.